"It's More Than Just a Race"
Steve Prefontaine brought an unparalleled intensity to every race he ran. As he once said, "If you can't stand pain, you can't run the distances," and "Somebody may beat me, but they are going to have to bleed to do it." He left an indelible mark on American distance running and his achievements continue to inspire runners the world over, his legacy is more than just a race. We are honored to present this poster of Pre, with the approval of his family, featuring one of the most famous photos of him ever taken. 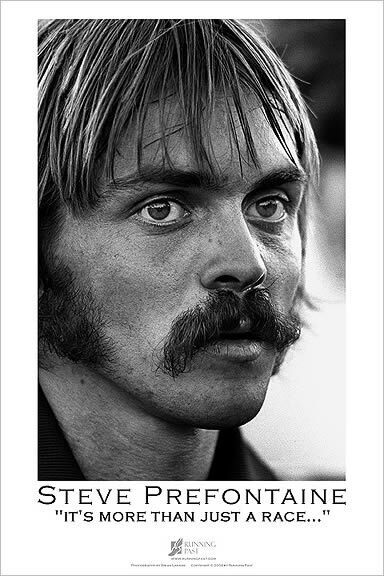 Steve Prefontaine photograph copyright by Brian Lanker. This photo may not be reproduced without his permission. Brian Lanker is a Pulitzer Prize-winning photojournalist. in LIFE Magazine and Sports Illustrated. Shipped USPS Priority Mail - tube/rolled. CT residents please add $.90 per poster sales tax.